Most users said that the Brooks Glycerin 15 is a comfortable shoe. A number of users mentioned that the fit of the shoe felt just right. One user was glad to say that the shoe offered a springy ride. A few testers were happy to note that the shoe did not need to be broken in. Some users said that the quality of the shoe and the features it came with was worth the price. Many runners said that the leg pain they usually felt due to foot and leg problems diminished when they ran with the Brooks Glycerin 15. Several users narrated that the cushioning of the Glycerin 15 was a welcome update. The Glycerin 15 is a lightweight shoe which plenty of runners appreciated in their reviews. The majority of consumers mentioned that the Glycerin 15 felt smaller than their usual preferences. Most reviewers said that the shoe didn’t have enough arch support. They stated that the shoe is not recommended for those with high arches. A user who had low ankles found the collar of the shoe to be inconvenient because it caused some rubbing. Another user narrated that the footbed cushioning resulted in the shoe being noticeably less stable than the former model. A few runners were able to test the shoe by running 70-75 miles. They said that they were unsatisfied about seeing signs of early wear on the outsole. Lighter than ever, the Brooks Glycerin 15 is the most awaited updated of the Glycerin 14. It’s a neutral road running shoe equipped with premium comfort and fit. It can be a reliable companion when doing short runs or light workouts. How Good Is Running In Version 15 of The Brooks Glycerin? It’s a “natural daily trainer.” (Running Warehouse) Do we agree? Brooks, is what some would term “a big guy shoe.” But it’s in no way restricted to bigger runners in terms of its uses and strengths. The Glycerin weighs 10.3 ounces, is technically neutral, and sits on a 10mm heel drop. It’s said to be a medium volume model in terms of fit, but I found it to be somewhat roomy – better to be slightly big than too small, and there was enough room up front to keep all of my toes happy. The Glycerin offers blown rubber in the forefoot, accompanied by two full and three partial flex grooves. On city streets and sidewalks, the Glycerin provides a springy ride and is as stable as one could possibly ask for. The Glycerin has a soft, abrasion resistant heel but Brooks proves that one can make a soft heeled model which provides for distinct, noticeable heel strikes. Perhaps it’s because the heel is noticeably built up – there’s a lot of rubber back there! The Glycerin offers up an excellent transition from heel strike onto the midfoot landing, and then onto the forefoot. There’s somewhat of a rocker feel to the Glycerin’s ride pattern. While the Glycerin feels soft it’s also substantial. This is not a wimpy runner. It’s immediately clear from one’s first steps in the Glycerin that it’s a substantially protective shoe. Once one gets moving in the Glycerin, the Super DNA midsole allows one to build up momentum, making it a good candidate for use as a pace trainer. Being that the Glycerin is highly protective and possesses a relatively grippy sole, I began to wonder how effective it might be as a trail running tool. I decided to find out by trampling on a few unique surfaces. On a dirt and gravel-covered trail, the Glycerin supplies a good amount of trail feel. The ride on this surface is protective and steady. On a hard-packed dirt trail, the Glycerin proves to be secure, stable and nimble. The one place where the Glycerin falls short is on a trail composed of large and small rocks. Here the shoe’s lugs fail to grip well and one’s feet slide all over. While the runner’s feet are not punished, there’s a high risk of falling from the slippage. So avoid rock-strewn trails in the Glycerin and stick with a dedicated trail shoe to avoid exigent trips to the emergency room. The Glycerin has as much cushioning as one will ever need. In fact, it has so much cushioning that the shoe created a problem for me. I have relatively inflexible feet, which causes my toes to compensate by attempting to grip and grab surfaces with each step. My toes are constantly moving around. In the Glycerin, the very ample cushioning meant that my toes were locked in place. And so my big toe began to complain after runs in the shoe, and I would develop forefoot numbness. Fortunately, the vast majority of runners – 95% or so, will not have to deal with this issue. For a larger shoe, the Glycerin is surprisingly flexible. However, it would benefit from an increased amount of flexibility to compensate for the high level of cushioning that works against forefoot flexing. As mentioned earlier, the Glycerin’s ride is springy but not so much so that it produces wasted energy. While the Glycerin permits one to build-up momentum while running, it’s not a shoe that’s going to enhance speed training sessions. Although the Glycerin will work for many as a daily trainer, I see it as being a natural recovery and long-run shoe. Brooks loyalists could use the Revel or Launch 4 as their daily trainer (keep in mind that the Launch 4 is the more neutral of these two models), and use the impressive Asteria flat as a race day shoe. An alternate rotation would involve using the Mizuno Wave Shadow or Adidas PureBOOST DPR as a daily trainer, and the New Balance 1400 v5 as the shoe to slip on for race day. The Glycerin is a true Jack-of-all-trades. It does almost everything well, quite well, and suffers from only a couple of minor defects – which is true of all running shoes, no matter how well-designed and built. All in all, the shoe is close to being as good as it gets. The majority of runners will be able to use this fifteenth edition of the Glycerin as a reliable, safe trainer and/or as a recovery or long run shoe. It’s a fine choice for training runs of 10K to 10 miles and should offer a high level of security and protection for distances up to 26.2 miles. The Glycerin is not an inexpensive shoe but its build quality is evident. It’s a durable shoe that should provide many problem-free miles for its purchasers. 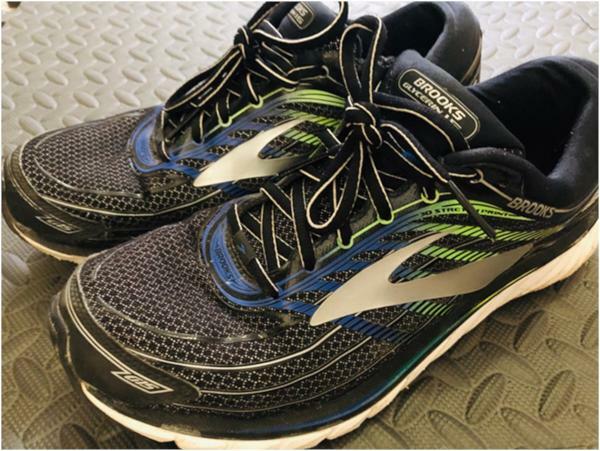 Brooks Glycerin 15: The best in its category? 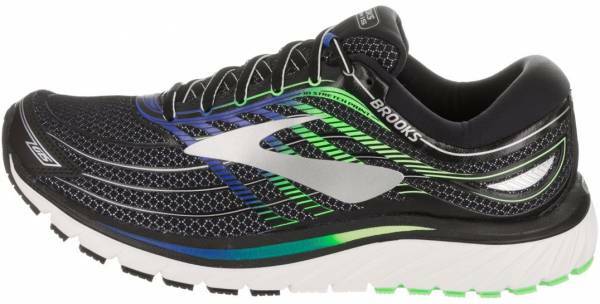 In 2017, Glycerin 15, Brooks' best-cushioned shoe, which is my favorite category. As far as appearance is concerned, I usually go for darker colors, so I got the black one, but in total, you have around 10 color variations. The upper part is really nice, with premium fabric and sleek details. The grey shining circles throughout the shoe is a plus for me, it’s something you don`t see but made the shoe very sleek and futuristic. On the side, you can see the color details are fluid and nothing stands out too much, besides their logo of course ;-). My only comment here which is actually common for other brands is that I wished they used different midsole colors besides white. As a comparison, Asics does a good job to balance that out on their premium models. When you wear Glycerin 15, you can feel right away how much they have invested in it. The upper layer is well built and thick in order to comfort and protect the foot at the same time. You can't feel manufacturing marks, no seam that could bother the usage. In terms of toe protection, the toe box is very solid with double layered fabric on the tip of the shoe. Also, despite is its closed fabric, ventilation can be felt from the top and side of the shoe which makes the whole experience great. Glycerin 15 is known to be Brooks' most cushioned shoe, and after a couple of months using it, I can tell you it does its job very well. In terms of weight, it's just around the middle for its category, not being the lightest or the heaviest, but the Super DNA technology makes the energy return very solid. It has a good level of responsiveness without sacrificing flexibility, great job for a shoe with a 10mm drop. Stability wise, at first I felt it was not going to pass my requirements since is it’s kind of a thick wide shoe in comparison to the Asics and Nike models I am used to, so I thought the stability would be worse. But to my surprise, the well-constructed upper surrounding the ankle made me secure during exercise and the thick layer of fabric and heel support were also great stabilizers. In addition to that, the “wider” approach was also good for my high arch, which got me surprised since I saw reviews saying otherwise. For the sole, another positive surprise here. As you can see from the pic, the sole is separated in 4 different colors and shapes plus the super DNA tag in between. This space is what Brooks calls “Plush Transition Zone” and its built to give lighter, smoother and more stable heel to toe transition. You probably won`t realize it until you see you are running faster and lighter than what you are used to. Another plus is the grip of the sole. Due to the different shapes of the 4 parts of the sole highlighted by the orange arrows below, I felt a good traction for the terrains I tested - asphalt, sidewalks, earth, and grass. Together with good stability, it also performed well on uneven surfaces. And lastly, there is a reflective mark on the back of the shoe, which is a plus for night outdoor runners. Brooks Glycerin 15 is a high cushioned shoe with premium materials and high manufacturing quality. It is the second of its line to use Super DNA cushioning technology which provides smooth run feel with good stability and grip for different surfaces. It’s not the lightest of its category, which in my opinion could be improved, but I believe this is justified when you take into consideration the plush fit on the upper and solid construction on the edges of the shoe. 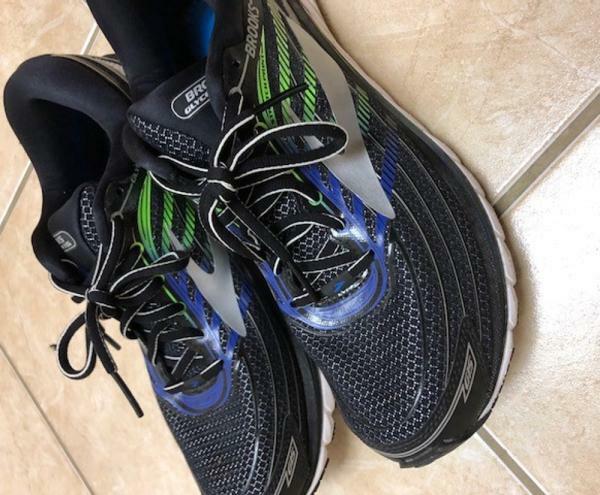 If you are looking for a well-cushioned shoe, I would definitely recommend Glycerin 15 because of its built quality, comfort and great relation between cushion and stability, translating to an overall fantastic running experience. The Glycerin is pure comfort offering a smooth ride throughout. There is plenty of cushioning mixed with a soft and supple upper. A stark difference from any other shoe is the supple ankle and upper foot padding offered by Brooks. The Glycerin rides like a full-size SUV, it is extraordinarily comfortable but does not offer much in the way of speed. The Glycerin carries a bit of extra weight compared to most shoes in the market now. The Glycerin upper fits like a wool sock in the middle of winter, perfect. The tongue and ankle offer a good amount of padding surrounding the upper area of the foot. When your foot slides into the Glycerin it feels remarkably secure, while maintaining comfort. Padding surrounding your upper foot makes your foot feet like it is surrounded by pillows. Brooks has really perfected comfort in the upper shoe with their Plush 3D Fit Print Technology, that adapts and expands to fit your stride. The ride of Brooks claims that the Super DNA midsole provides 25% more adaptable cushioning than their standard DNA midsole. Brooks has also emphasized their plush transition zone, offering more flexibility in combination with the cushioning. Both features combine flexibility and cushioning into a smooth and comfortable ride. These shoes really do take comfort to the next level. The Brooks Glycerin is a decked out, premium package SUV, not a sports car. It has all the comfort you need for the long trip. All of the comfort amenities come in a package that creates a bit more weight and a bit of a bulky feel. Just like you wouldn’t take an SUV to the race track you wouldn’t make the Glycerin your tempo run or race day shoe. The Glycerin is well built and built to last. It handles quite a bit of mileage well without too much wear and tear. The thicker sole and well-constructed upper offer longevity that most shoes on the market today do not have. Again, this construction adds a bit to the weight of the shoe overall, but understanding this is not your race day shoe will go a long way to enjoy a bit of a heavier ride. The SUV of running shoes, not only the SUV but the premium package, limited edition. It isn’t small and it isn’t quick but it will get you to your destination comfortably and leave you refreshed when you get there. When running higher mileage the Glycerin is a perfect addition to the rotation to ease the pounding. Anyone investing in a good pair of running shoes will wind up learning that Brooks is well established in the running industry for many reasons. Brooks Glycerin line has been around the block competing for shoe brands offering several versions of their high-mileage daily trainers, and might just be the top in this category. After all, elite runner and 2018 Boston Marathon winner Des Linden is said to love them and own five to seven pairs herself. Below, you’ll find my review of this shoe after spending over a year and 500 miles training, shortly after version 15 was released. When I first put the Glycerin 15 on, it felt like lipping into a well-fitted sock. The upper is constructed of a tight mesh with minimal seams. Its minimalistic engineering allows the feet to move without any hot spots, rubbing or blisters. The cushioning felt plush with a wide and stable footbed. The designed overlays are minimal and Brooks uses a well-designed mesh that is a step above the mesh from version 14. Although this mesh material is breathable, I noticed that during cold runs, my feet were not at all too cold and remained warm even with thinner athletic socks. Rainy days were no match for the mesh upper. However, due to the material absorbing more than repelling the water and making the shoes feel even heavier than the 10.4 ounces per shoe. 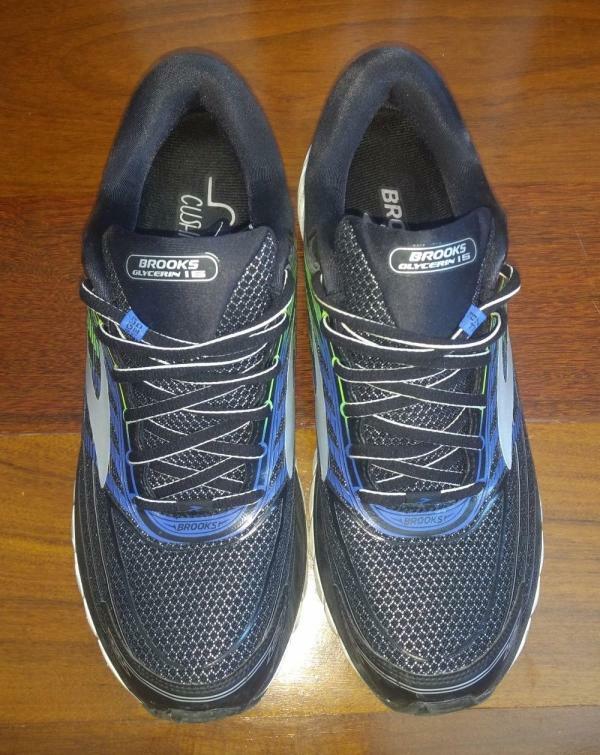 Brook’s Super DNA cushioning uses in the Glycerin 15 which supposedly adapts to each individual’s foot shape more than the standard cushion technology. Considering that this shoe is on the heavier side of trainers (10.4 oz. ), the midsole provides some energy return on long runs and even while picking up the pace during extended tempo runs. Overall, the midfoot has enough cushion to absorb whatever a runner chooses to throw at it. The 10 mm drop allowed long runs to be completed efficiently with a good turnover throughout the latter part of training runs where one might be prone to slow down his or her cadence. The outsole sits on a wide and level plane from heel to toe making transitions on and off the ground very efficient and easy. Rubber is present on nearly 80-90 percent of the outsole with very minimal exposed foam. Intentional grooves placed strategically across the bottom sole to allow flexibility while stepping through your running gait. I found that the rubber offered plenty of grip even on wet surfaces. The grooves allow the shoe to flex more than the previous version. Take note, using these on gravel terrain will cause pebbles and small rocks to get stuck in some grooves and mainly where they begin directly in front of the heel. Brooks Glycerin 15 is a simple yet durable trainer during long miles in all types of weather and terrain conditions. Brooks chose to keep what works while implementing new technology for beginners up to elite long-distance runner. The unparalleled styling, durability, comfort, and performance of the Glycerin 15 makes it the best version yet and will be a staple in most runners’ shoe rotation. The 15th version of the Brooks Glycerin has received a number of updates on its features that target the feel and ride provided to runners. The midsole design was improved to deliver a softer feel on the foot when running. The less bulky ridges on the sides of the platform also offer more flexibility. On the outsole, specific transition zones that can be found on areas underneath the heel have been incorporated to make the movement transition from heel to toe easier and smoother. In some colorways, these areas are indicated with a unique color scheme. The upper’s design was also improved with the next-generation 3D stretch print saddle which has an elastic characteristic. This type of saddle material moves and stretches together with the movement of the foot, allowing more care-free motion without worrying about rigidity and stiffness. The Glycerin 15 comes in standard shoe sizes. Those interested in a pair will be able to purchase the shoe in the usual size measurements preferred. As for the width, Brooks made sure that there were more options. The Glycerin 15 is available in narrow, standard and wide widths for both males and females. Ideal Pressure Zones can be seen on the outsole of the Glycerin 15. These spots are part of the tread pattern and have been strategically placed to disperse impact during the landing phase of the gait cycle. These pressure zones are plush, so the transition from heel to toe is more balanced and efficient. The outsole of this Brooks running shoe is made up of two kinds of rubber. On the forefoot area is blown rubber, which offers durability and flexibility. HPR Plus makes up the outsole on the heel area. This tough material is used o because it is highly abrasion-resistant and it gives the shoe more surface grip. The same material is also found in the Glycerin 16. The Brooks Omega Flex Grooves have been introduced to the outsole as well. The function of these grooves is more towards the midsole as it offers better flexibility without sacrificing the shoe’s cushioning. As with other outsole technologies, these flex grooves make it possible for the shoe to freely go with the motion of the foot. To accommodate flexibility, the midsole has been designed to have caterpillar crash pads. These are the ridges on the sides of the shoe that help with flexibility. As the shoe moves, the ridges give way for foot-movement, making the midsole less resistant or stiff. The cushioning of the Brooks Glycerin 15 is known as Super DNA. It’s a type of cushioning that provides 25% more in terms of adaptability when compared to standard midsole cushions. This cushion molds to the foot and adapts to the changes in pace. Also, it heightens the runner’s underfoot experience, providing a light and soft feel. When it comes to the material of the midsole, Brooks put in the S-257 Cushsole. It is a compound that’s used to compliment the cushioned underfoot feel and the flexible characteristics of the shoe. The upper of the 15th version of the Glycerin is made of breathable Air Mesh that allows air to flow throughout the shoe. This means lesser hotspots and better ventilation when the shoe is worn. Aside from being breathable, it also stretches in different directions, giving the runner a more adaptive fit. 3D Stretch Printed overlays have been placed on specific locations on the upper of the shoe. This design works well with the seamless feel and provides lightweight support to the lateral and medial sections. To make the fit even more secure and customized, Brooks added an adjustable saddle on the upper of the Glycerin 15. This design has been incorporated along with the lacing system. Tightening the laces will also net an equivalent response from the saddle. Brooks also made sure that the collar of the shoe is comfortable. It has been made plush, so it gives the ankle enough cushioning.